Bijlmer Euro » Long live the Bijlmer Euro! Long live the Bijlmer Euro! The Bijlmer Euro trial has come to a close. It was a test of a new kind of parasitical local currency that builds on official money and adds local value on top. The project has been an amazing success. 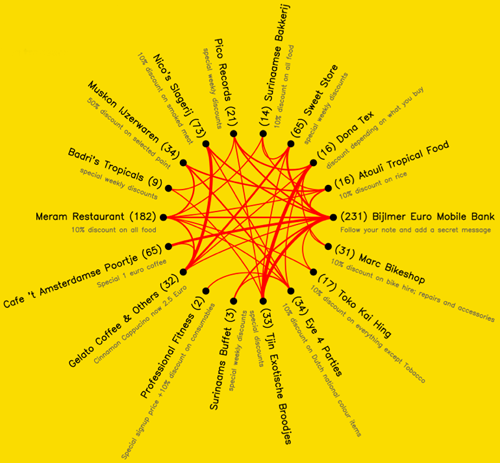 We setup a network of 18 locally owned Bijlmer shops, who got actively involved in promoting the project and offering discounts. 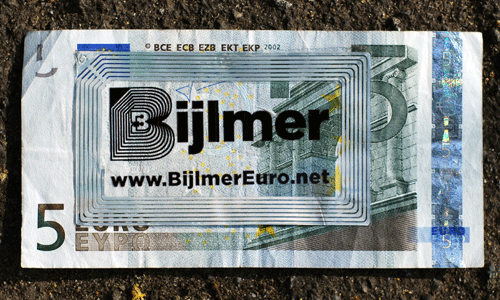 Due to the electronics tag on on the Bijlmer Euros we know that over 3 months, we have had 647 purchases with Bijlmer Euros which means that we have kept roughly €4852.5 in the local economy which might have left the local area. Click to see the final diagram. Yet it is the social and cultural value of the project, which is crucial and yet unmeasurable. The project has generated a huge local & national discussion on the role of money in people’s lives and local areas. We hope the Bijlmer Euro is inspirational for a variety of other new and wonderful value systems that will build social, cultural and economic solidarity as we face the challenge of climate change and peak oil. Thanks to all the participants and supporters of this project!